Those Europeans sure do love their football and this massive and unique outdoor board from Adidas placed over a bridge construction site is a clear representation of that love. The board features German goalkeeper Oliver Kahn making a killer save. If Americans displayed their love of things this way, we'd have a gigantic image of Tom Cruise jumping over a highway shaped like a couch or a floating Army of inflatable paparazzi chasing Britney Spears and she dropped her baby from the top of the Empire State Building. Thankfully, we're just not that creative. Cool looking, but a little weird, since Kahn is Germany's backup keeper this time and may not play a single minute in the World Cup. Well Kahn is an endorser of adidas. 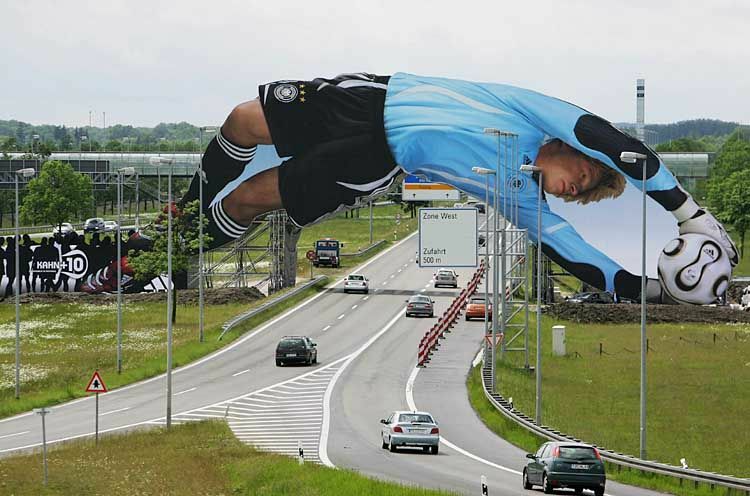 I'm sure they approved of the billboard before Klinsmann's bold decision. The International Football Association Board (IFAB) agreed to trial a �smartball� developed by sports equipment giant Adidas which contains a microchip that bleeps when it crosses lines fitted with special sensors.